There is something absolutely beautiful and just down right majestic about Sedona. This Arizona destination became popular among those looking to get away from it all. Many people claim that the nearby red mountains have healing properties as well, which might explain why so many people who live in the area look happy and healthy. Even if you just want to enjoy the sunrise in the morning or play a few rounds of golf in the afternoon, you'll love the experience of staying in the Villas at Poco Diablo. 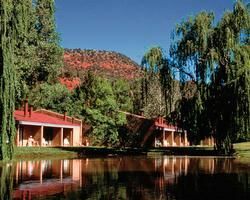 These Sedona timeshares for sale offers two types of units to choose from for your next vacation. Its studios are much larger and more spacious than you might expect. You'll walk through the front door into your own small kitchen before seeing an open layout that includes a small living area and an attached bedroom. Studios are perfect for a romantic vacation or a solo trip. If you prefer privacy, look for one-bedroom timeshares that come with a kitchen, bathroom, living area and bedroom. One of the best reasons to buy one of these Sedona timeshares for sale is because of the special events taking place every month. The resort offers movie nights, concerts, arts and crafts classes, magic shows and even ice cream socials. You can also enjoy fine dining restaurants and golf courses near the resort. Other popular regional attractions include hiking, shopping and playing tennis. Guests will also find a swimming pool and barbecue grills at the resort. You may prefer staying inside your room and relaxing in your own private whirlpool or chatting with other guests on the resort's patio, which offers the best views of the area. The Villas at Poco Diablo is the perfect place to get away from it all and escape daily life for a few days or longer. Contact Villas at Poco Diablo Specialist Today!